Hey guys! 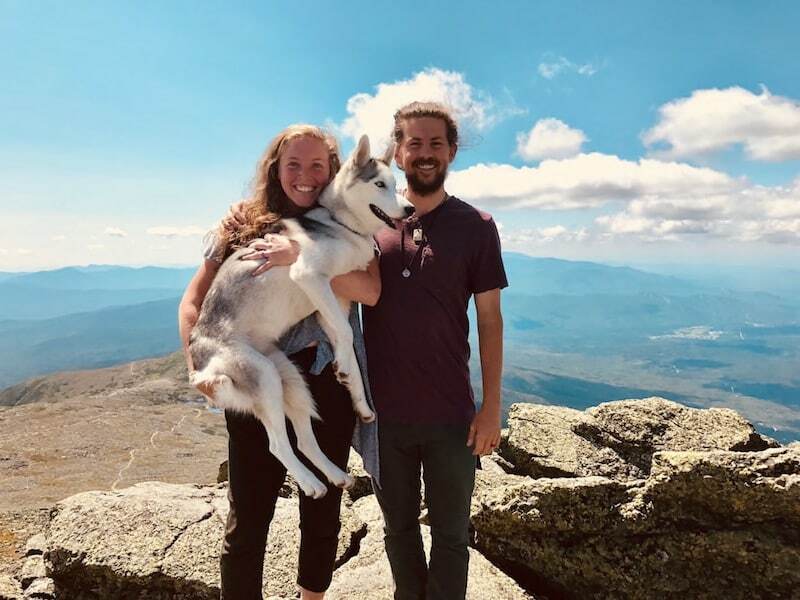 So, we are back for our second installment of what we like to call our “Dog Blog” and it consists of some of the bigger topics related to a long-distance hike with a dog. Again, if you ever have questions for us that you don’t see answered on here, please send us an email! We are trying to compile as much information together as we can, so you can expect quite a few blogs with our opinions/experiences in the near future – both related and unrelated to our Pneuma girl. This seems to be a ‘hot topic’ amongst dog owners out on the trail, which we were somewhat surprised about. We knew, from research, that diet would be a really important factor in Pneuma’s duration on the Trail. Most blogs we were reading told us that regular dog food simply wouldn’t be enough, that you should always be carrying supplements to add into your dog’s food to ensure they are getting enough nutrients to survive. Makes sense, right? Just like we as humans have to be extremely mindful about the food we eat on these long-distance treks, of course we should treat our dogs’ nutrition the same way. But, there are a lot of things to consider before just choosing the bag of food from a shelf with the highest amounts of proteins, vitamins, etc. We did a lot of thinking about what would be best for Pneuma specifically and we ultimately chose to keep her on her regular dry food and supplement it with things to add calories and nutrients. Several people gave us grief about this because “don’t you know they make ultra-light meals for dogs that have way more protein” or “dry food must be so boring for her to eat while she’s working so hard for you”, but what those people weren’t taking into account is that we did a ton of research and actually tried various tactics before we left to find the best solution for her specifically. I cannot stress enough: every dog is different. Especially when it comes to eating patterns/habits. Pneuma’s regular day-to-day food is Nutro’s chicken and sweet potato blend for adult large breeds. When she was just a pup, we did a lot of research on the best type of food for huskies, but as you can imagine, people have plenty of opinions on the matter so we ended up just asking our vet. He gave us several recommendations and we eventually decided that Nutro seemed to be our best bet, so that is what she has been chowing down on since she was 8 weeks old. Something to keep in mind during this decision is that most dogs are extremely sensitive to changes in their diets, especially when they’ve been eating the same thing for a long time. But there is a little trick that most people don’t think about (including us): get the puppy blend! Pneuma had already transitioned to the adult blend before we left and we didn’t even think about grabbing the puppy mix, but it is always packed full of more nutrients and calories! For supplements, we used peanut butter powder for fats/calories and different meats that we would grab from towns for extra protein. We eventually added in a daily multivitamin for dogs because, well, even dogs need a steady stream of vitamins and minerals. We did add all of this stuff into her food for the extra nutritional values, but also to entice her to actually eat her food every day. It is very common to hear people thru-hiking with their dogs talk about their dogs’ extreme loss of appetite, especially in the first couple of weeks on trail. This is really tricky because it can get dangerous very quickly. It isn’t something that we had to really worry about much because huskies are fairly renown for just eating what they need, when they need it; but we did have a couple of run-ins with Pneuma not eating enough. It really comes down to knowing your dog in these moments, but it is something to keep in mind. If you know there are one or two things that your dog just cannot get enough of – make sure you have some on hand at all times, no matter how much it weighs! Another question that often comes up about dog food on trail is whether or not you can find it in each town. This is really important to think about, you guys. Because like I said earlier: a lot of dogs are extremely sensitive to changes in their diets. There are absolutely zero guarantees that the towns/stores you are going to be going into have the brand of dog food that your dog is accustomed to. And, honestly, there were many towns that we went into that didn’t have dog food at all. That sounds crazy, right? Because all Walmart’s and Publix’s and CVS’s have dog food – duh! But you have to remember: 75% of the “towns” you’ll be coming across aren’t very developed and you’ll be at the mercy of the one gas station or Mom & Pop grocery store that is there. The way we got around this: we bought a TON of Pneuma’s food before we left, measured out 2 cups into Ziploc bags and packed 10-15 of those bags into boxes along with measured PB powder and treats. We then made a massive spreadsheet of where we thought we’d be every 5 days and handed it all off to my parents who graciously committed to sending all of our food drops to us along the way. It was a lot of work. Like, a lot. But in our opinion, so worth it! We never had to worry about having food for Pneuma or not based on a town’s selection and there were plenty of opportunities for us to leave dog food as trail magic at various hostels/hotels along the way. In no way are we saying that is the 100% right thing to do, but if your dog has a sensitive stomach (like Pneuma), then I would highly recommend doing so! Yep, dogs have gear, too! Pack: We used the Ruffwear Palisades pack with Pneuma and absolutely loved it. It is incredibly convenient because the pack clips on and off of the harness it comes with. That way, if it was really hot of Pneuma got tired going uphill, we could just unclip the pack and keep on our way! There are also a TON of different pockets/compartments to stick stuff in, so everything had its place. It lasted a surprising amount of miles before it showed any wear and tear which is a MIRACLE considering how our gal loved rubbing it against trees, rocks, bridges, etc. trying to get it off of her back, ha! Side note here on packs on dogs: don’t let people telling you that making a dog carry a pack is torture to them deter you immediately. Most dogs like to work to make their owners proud and it is our duty to allow them opportunities to do so. It isn’t selfish at all. Our girl wasn’t a huge fan of the putting-it-on process, but she absolutely loved showing us what she could do on a daily basis! Our vet has told us countless times how important it is to let working breeds work – and Siberian Huskies are among the top of that list. Let your dog give it a try and see how they react before counting it out. And always remember – they should never be carrying more than 2-5% of their body weight. Leash: Pneuma’s leash was simply a piece of thick climbing rope with a carabineer on each end. Sounds crazy, but these are super easy to make yourself and can be made to any length you desire! It was incredibly durable (we are still using it today) and we found that hiking with a contractible leash or a leash that had any elasticity to it made it a lot harder on whomever was stuck on the other end of it. Children’s dissolvable Benadryl tablets – these are fast acting and dog-safe, I would just double-check with your vet before giving it to them, especially for dosages. We never had to give her this, but wanted to be safe in case of any allergic reactions! A small bottle of Hydrogen Peroxide – this was in case we ever had to induce vomiting. Sounds extreme, but if she were to ever drink stagnant water or eat mushrooms, etc. we would of rather gotten it out ASAP rather than wait on the potential repercussions. Neosporin – we used this quite a bit! She never got any cuts, but we would put it on any spot where we pulled a tick off of just as a precaution. Gauze & Ace Bandage – just in case she were to ever get seriously injured! Medical Records – these are very important. We had her vaccination records and her chip ID information in case she ever got separated from us or had to be hospitalized (which she did). There are also places along the trail that might require these of you – it’s just safe to always have these when traveling anywhere with your pet! Tick Collar – you can actually use this and the other type of tick medication you use. We never felt brave enough to put it on her due to the potential side effects of it, but it was nice to have the option. Bravecto – this is the 12-week protection against fleas and ticks. It is a beef-flavored chew tablet and it works wonders! It definitely starts to wear out around weeks 9-12, but you can tell that the ticks would die as soon as they tried to latch on within the first two months. We still did routine tick checks every night because they are relentless in the warm months, but Bravecto kept her from getting lyme disease, no doubt. We brought 2 of these with us so she was protected our entire trip. Sentinel – this is a heartworm/parasite/flea protection that also comes in a beef-flavored tablet, but it is to be taken every month. All dogs should be on this type of medication regardless, this is just the one we chose! We took 8 of these with us, just in case. Tweezers – these ended up being in Gibberish’s fanny pack once we hit Shenandoah National Park because we were pulling 20+ ticks off the three of us daily. They do make specific tick keys you could use, but we found tweezers to work really well. Pad Protection: My favorite thing we carried for Pneuma: the Natural Dog Company’s Pawtector and Paw Soother. We originally brought a pair of Ruffwear booties for Pneuma and we carried them for about 300 miles – only used them once. We knew that there were things that could/would agitate her pads and that was one of the biggest reasons dogs have to get off trail. We raised Pneuma walking on trails and rough terrain to weather her pads, but we brought along the boots for snow/ice, rocky terrain, really hot days, etc. The first time it snowed on us, we tried putting them on her and they lasted about 3 miles. The velcro got coated with snow and wouldn’t stay closed, but they also seemed to be disturbing Pneuma’s natural gait. Long story short, someone on Instagram reached out to us about the Natural Dog Company products and after researching them a little bit, we decided to purchase them. OH MY GOSH. These products are all-natural waxes that smell amazing and work super well. We would apply the Pawtector every morning before we left camp and again at lunch – it coats the pads in order to protect them from heat/rough terrain – and we applied the Soother every night before we fell asleep to rejuvenate her pads before the next morning. We never had even the slightest issue with her pads – I honestly cannot recommend these products enough! This is another extremely hot topic along the trail. For the most part, pretty much everyone we met along the trail loved Pneuma! But I will go ahead and let you know, there are definitely hikers out there that will be very weary of you having a dog and it’s really important to be sensitive to that. I’ll also tell you, we kept Pneuma on leash the whole time. This was partly because huskies have an incessant desire to escape and chase things to no avail, but it also helped us be sure that people wanted to interact with her before she had the chance to run to them. While Pneuma is very friendly and we were never really worried that she would act inappropriately around people, some people may of had bad experiences with dogs or something else that causes them to be fearful around all dogs. You definitely never want to cause another hiker grief or make them feel unsafe, whether that feeling is justified or not. Like I said, most people will absolutely adore that you have a dog with you. There will be people who had to leave their dog(s) behind and will find comfort in the love of your dog, there will be solo hikers who are so lonely that your dog will be welcome company and there will be a point along the way that just about every person around you will find your dog therapeutic. So, just as you should use caution with your dog around certain people, you should also be prepared to share your dog with those around you when you can! Again, Log and I weren’t huge fans of people having their dog’s off leash either. To each his own, of course, but Pneuma isn’t always excited about meeting other dogs, especially when they are running towards her. It was a little frustrating when that would happen because we weren’t sure how Pneuma would react, but it was also frustrating to be stuck in one place until the owner finally caught up and gained control of their dog. If nothing else, you guys, just be sure that you follow the guidelines when certain areas demand that dogs be on leashes – and that’ll happen a good bit.